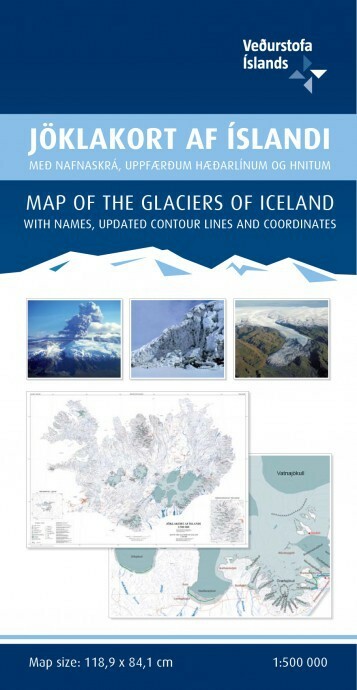 Map fo the glaciers of Iceland with names, updated contour lines and coordinates. Overview map of Iceland´s glaciers, including named and unnamed ice masses. The map shows changes in glacier extent since the Little Ice Age maximum, around 1890, to the beginning of the twenty-first century. Also shown is the extent of glaciers around the middle of the twentieth century. The main subglacial volcanoes are illustrated on the map. Note that surge-type glaciers are denoted in a separate colour. Information with map in Icelandic, English, French and German.